Girls from the Everyday Engineering summer camp at RIT will talk with astronaut Sunita Williams as part of the Amateur Radio on the International Space Station Program. 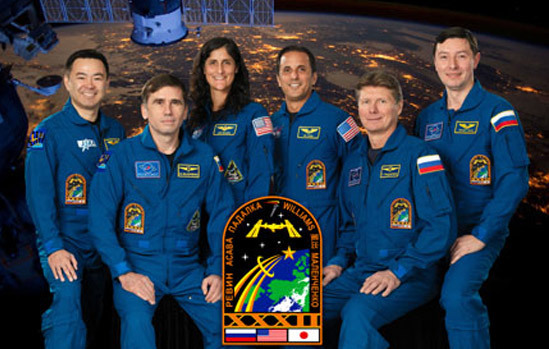 Pictured, from left, are flight engineers Akihiko Hoshide, Yuri Malenchenko, Sunita Williams and Joe Acaba, Commander Gennady Padalka and Flight Engineer Sergei Revin. It will be a giant step for woman-kind when campers in the Everyday Engineering Program at Rochester Institute of Technology connect with the International Space Station next week. The group of elementary and middle school-age girls participating in the camp sponsored by the Women in Engineering at RIT program will be connecting via amateur radio at 9:27 a.m. July 23 in the Xerox Auditorium in RIT’s Kate Gleason College of Engineering. The event is part of the Amateur Radio on the International Space Station program, a cooperative venture of NASA, the Amateur Radio Relay League and the Radio Amateur Satellite Corp. that organizes contact via amateur radio between astronauts aboard the International Space Station and classrooms and communities. This will be the first time RIT has connected to the International Space Station for educational programming, says James Stefano, academic advisor for RIT’s Amateur Radio Club. He will coordinate the uplink between the university and the space station, providing a live video feed of the space station as it travels overhead and the connection to the astronauts. The International Space Station circles Earth at nearly 17,000 miles per hour and will be within optimum connection space directly overhead for only 10-15 minutes, Stefano explains. Space-themed displays will be set up before and after the event in the Gordon Atrium, adjacent to the auditorium. Displays will feature student projects from the engineering camp, such as 3-D model space stations and rockets, and the “3-D Planeterrainium” developed by the RIT Insight Lab in the Chester F. Carlson Center for Imaging Science in the College of Science. Astronaut Ice Cream will also be given away to the more than 100 attendees expected from other RIT K-12 summer camps and invited community members. The girls prepared for the event through different projects and presentations about space technology and the role engineers play in the field. One activity was a presentation about astronaut Sunita Williams, currently on board the International Space Station and in line to be its next mission commander. The girls will talk with her during the connection about life aboard the space station and the varied missions. About the Amateur Radio on the International Space Station Program: An amateur radio station is operational onboard the International Space Station. Most astronauts have an amateur radio license and operate onboard the station to contact radio amateur ground stations in their free time. Per an agreement with multiple space agencies involved with building the International Space Station, the space station program prepares and implements educational contacts for students nearly every week. Amateur radio operators volunteer their radio station, expertise and time to make the conversations between the students and astronauts happen.